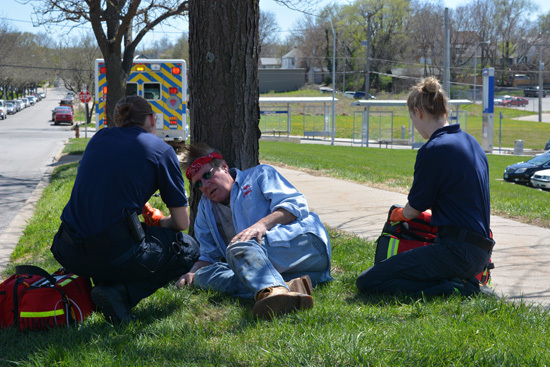 The UMKC Paramedic program is designed to introduce the EMT to the principles and practices of advanced life support and pre-hospital emergency medical care. The program is based upon the 2009 EMS Education Standards for Paramedic education. Upon successful completion of the program, a certificate will be awarded that permits the student to participate in the national certification examinations that lead to state licensure. The goal of the Paramedic program is to prepare competent entry-level Emergency Medical Technician-Paramedics in the cognitive (knowledge), psychomotor (skills), and affective (behavior) learning domains. Valid Missouri EMT-B license or ability to obtain Missouri reciprocity (NREMT) prior to start of program. Submission of a written application and three letters of reference. Wonderlic SLE score of 18 or greater. Completion of an EMT knowledge test. Attendance at a program orientation session. College-level A&P course or complete the A&P review course offered by the program. Obtain course required criminal background check no later than the third week of class. Obtain a 10-panel drug test no later than the third week of class. Submit clinical health requirements no later than the third week of class. Computer access, with internet access, email, and printer for homework. The UMKC Paramedic Program is approved by the Missouri Department of Health and Senior Services Bureau of EMS (09529T6). The program curriculum exceeds that of both the U.S. Department of Transportation and the Missouri Bureau of EMS. Please download the above documents and proceed to the registration form by clicking here.